This week, "Philip's Glass Menagerie" gives a twist to Tennessee. Plus openings, closings, the tax man giveth, and a dash of Randy Rainbow. 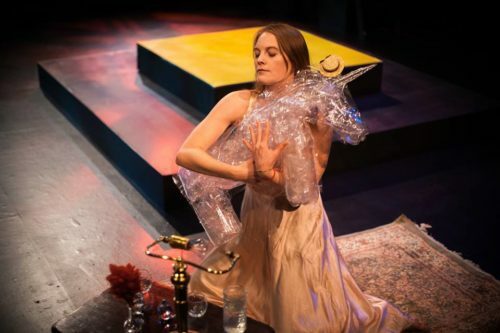 “Being a ‘memory play,’ The Glass Menagerie can be presented with unusual freedom of convention,” wrote Tennessee Williams in the production notes to his great 1940s story of a family trapped between hard realities and comforting illusions. Williams might never have suspected, however, that “unusual freedom” would result in the story being presented as an elliptical string of nearly wordless comic vignettes, performed by clowns in drag. The “whether or not” question may already have been answered by a successful workshop production earlier this year during the Fertile Ground festival. But why apply such serious silliness to, of all things, a heartbreaking examination of fragility? As Cuomo — who also is CoHo’s producing artistic director — describes it during a recent break in rehearsals, the seed of the concept came in 2014 when he directed The Mystery of Irma Vep for Third Rail Rep. Isaac Lamb, in drag as Dame Edith, began doing a variety of women’s voices one day during a tech rehearsal, and when he dropped into the sweet drawl of a Southern belle, Cuomo told him he should someday play the Menagerie matron Amanda Wingfield. More central to the project’s development was Cuomo’s teaching at Portland Actors Conservatory. “I became really interested in mid-century American realism as a contextual jumping-off place,” he says. “In a way, I was looking for an excuse for assigning plays that I love and think everybody should read, but while I was teaching a clown class. Later, encountering the dancer Andrea Parson (who starred in another Summerfest show a couple of weeks ago) in a clown workshop gave him the idea of casting a woman as the “gentleman caller” in the show, a role eventually taken by Emily Newton. Surely part of what feels right is his cast, for which he says he wanted a strong mix of “clowning experience, devising experience and comic chops.” Lamb is among Portland theater’s most versatile and popular performers. He calls Newton “the funniest person I’ve ever met,” and from half a rehearsal’s worth of her quick-witted inventiveness and their joshing chemistry it’s easy to see why. Murri Lazaroff-Babin, who Cuomo taught at PAC, brings a sharp, expressive quality to Tom, the frustrated writer/narrator of the piece. And Sascha Blocker, a veteran of several Cuomo projects, is lovely, precise, emotionally transparent — the qualities you want in the fetching yet frightened Laura, the play’s fragile fulcrum. Together with Cuomo, the actors devised “bits in response to the actions of the play,” comic riffs off of its images, themes and points of narrative tension. For instance, Amanda’s concern with appearances and social status becomes a bit with Lamb, beleaguered by a relentlessly ringing doorbell, frantically trying to put on long, red silk gloves. Throughout, Williams’ text comes only in snatches — “I’m going to the movies,” “rise and shine,” “blue roses” — isolated, repeated phrases. Cuomo credits the strength of the play’s original structure for helping even his radical re-working to work, but he also has a deep belief in the value of clowning. Fans of the play might see his approach as disrespectful of the tender emotion Williams evokes so powerfully, but Cuomo sees it differently. “Instead of undermining it, we’re opening the audience up to it,” he insists, noting how the exaggerations of clowning serve to heighten character and point of view. Seldom is the term “back taxes” a happy one to encounter. On July 16, however, the Regional Arts & Culture Council (RACC) announced that the collection of more than $3 million in “unanticipated revenues” — overdue payments to the Arts Education and Access Fund, better-known as the unjustly maligned “arts tax” — has allowed it to give money to 52 Portland arts organizations for general operating support. After setting some money aside for project grants, equity and capacity-building endeavors and the like, RACC had $2,464,000 to disburse, “applying an equity framework to city code that regulates how RACC distributes arts tax proceeds.” Whatever that means. In any case, the big, six-figure recipients are no surprise — the Oregon Symphony Association, the Portland Art Museum, Oregon Ballet Theatre, Portland Opera, and Portland Center Stage. Among practitioners of the most important art form (why, theater, of course! ), other recipients included Artists Rep, CoHo Productions, Hand2Mouth, Imago, Oregon Children’s Theatre, Northwest Children’s Theatre, Miracle Theatre, Playwrite Inc., Portland Playhouse, Profile Theatre, Third Rail Rep, Triangle Theatre, and the August Wilson Red Door Project. This, of course, is altogether good news. I am left, though, with curiosity about the operation of that “equity framework” and whatever other considerations shaped the allocation: A mere $18,500 for the wondrous Imago? Fans of the frothy yet biting musical-theater works of Gilbert and Sullivan usually can count on a late-spring/early-summer fix from Mocks Crest Opera out at the University of Portland. But this year that company opted instead to stage the sublime Adam Guettel/Craig Lucas musical The Light in the Piazza (an overall marvelous production, by the way, though marred by a shockingly hamfisted misreading of the central role). For all the artfulness a good scenic designer can bring to a production, there’s something hard to beat about an at-once apt and beautiful outdoor setting. Villa Catalana Cellars in Oregon City, with its Old World architecture and Medieval-inspired gardens, looks like reason enough to present the evening of loosely related entertainments being billed as Kisses and Fools. Lewis & Clark theater professor Stepan Simek will direct a set of Shakespearean vignettes with an emphasis on kissing scenes. A pair of European actors will perform in the Commedia del Arte style. The Oregon Renaissance Band will perform on its own as well as accompany the drama. And there’ll even be a “Renaissance buffet” available. The notion of tarting up Shakespeare with burlesque dancers and circus performers, as Rose City Shakespeare Company’s A Midsummer Night’s Dream Burlesque will do, immediately strikes me as, well, silly. But then I remember the terrific 2008 Midsummer at OSF, directed by Mark Rucker, set in a nightclub-like, tulle-and-fishnet-filled Fairyland. And I remind myself not to be so close-minded. The Siren Theater in Old Town continues to expand beyond its sketch-and-improv fare with comedic plays. Deborah Zoe Laufer’s Out of Sterno is next up. The Phantom of the Opera — a “musical,” although it’s by Andrew Lloyd Webber, so surely the word is a noun but not an adjective — returns to the Keller Auditorium in what’s no doubt a garish — sorry, I must have meant lavish — touring production. A bit like the plight of a critic at an Andrew Lloyd Webber show. The Clackamas Rep production of Kate Hamill’s adaptation of Jane Austen’s Sense and Sensibility — not to be confused of course with OSF’s production of same, or the upcoming PCS take — is about to lose its senses, so to speak. ArtsWatch’s Bennett Campbell Ferguson bravely admitted to having contracted the “feverish sentimentality” of ABBA fandom. Those seeking the same sing-song sickness have just a few more chances at the contagion of Broadway Rose’s Mamma Mia. And theater fans whose tastes I respect have raved about Adroit Maneuvers, both for the relevance of its history-themed script and the lead performance by Diane Kondrat.